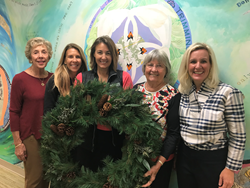 Members of the VNA Holly Day Market Committee prepare for the benefit boutique shopping event, which will take place on November 4-5, 2017. The Visiting Nurse Association (VNA) of Somerset Hills is proud to host the second annual Holly Day Market. Featuring a collection of specialty vendors and unique items from across the nation, this holiday-themed event will raise funds and awareness for the myriad of personalized and quality-focused health and wellness services offered by the VNA. The boutique will be open Saturday, November 4 (10:00 a.m. – 5:00 p.m.) and Sunday, November 5 (10:00 a.m. – 4:00 p.m.) at the VNA of Somerset Hills, located at 200 Mt. Airy Road in Basking Ridge, NJ. “We are thrilled with the excitement community members have expressed for this event as demonstrated by over 1,000 people attending last year,” stated Mona Gibson, Market Chairperson and VNA of Somerset Hills Trustee. “A ‘can’t miss event,’ our boutique features exclusive vendors selling items such as custom shoes for women, fine jewelry, monogrammed gifts, beautiful clothing and accessories, table linens, sweets and treats, and much more. We welcome everyone to this special venue to help ensure the VNA of Somerset Hills, an invaluable treasure for our community, can continue providing services to all those in need. Shops at the Holly Day Market include: A&J Accessories; Classic Home Christmas; Duende; Discovery Toys; Elyse Marie Botanicals; Estate Fine Linens; Everything is Rosey; JOTT; Just One Bite LLC; kk’s; Larger Cross; Lei-Lei; Peaceable Hill Paperie; Ride + Reflect; Secret Garden Soap of Madison; Stanton Sweets; Susan’s Jewelry; Sweet Meadow Studio; The Personalized Party; The Posh Shop; Three Wags; Thorn Hill; Tori Brown the Label; Ward Vintage; Windswept; and Zwikker and Zacher. The Visiting Nurse Association of Somerset Hills and its subsidiaries provide individuals and families with comprehensive, high quality, cost-effective home and community healthcare services, regardless of ability to pay, using partnerships where appropriate. The VNA is a charitable, tax-exempt home health agency and hospice certified by Medicare, accredited by the Community Health Accreditation Program and licensed by the New Jersey Department of Health and Senior Services. Credentials include recognition as a 2016 HomeCare Elite® Agency.